Looking for a tutorial with an income statement example and explanation of how to put together this report? You're at the right place. The income statement is the first component of our financial statements. Not surprisingly, the income statement is also known as the profit and loss statement. The income statement's primary purpose is to show the financial performance of a business. The amount of profit or loss that a business makes during a certain period is the key indicator of its financial performance. The income statement is often abbreviated as IS or I/S. The above income statement format is a basic one - what is known as a "single-step" income statement (meaning, just one category of income and one category of expenses) and prepared specifically for a service business. Examples of service businesses are medical, accounting or legal practices, or a business that provides services such as plumbing, cleaning, consulting, design, etc. The income statement for a trading business (a business that buys and sells goods) and for a manufacturing business (a business that makes goods) is quite different to the one shown above. If you would like to see the multiple-step income statement format for a trading business then check out the lesson on Sales, Cost of Goods Sold and Gross Profit. To see the multiple-step income statement format for a manufacturing business check out the lesson on Accounting for Manufacturing Businesses. By the way, net profit is also sometimes called net income. 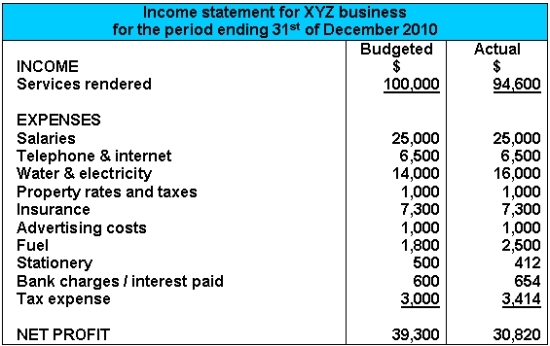 Also, there's a common expense in the income statement example above which we haven't yet covered in previous lessons. That expense is interest paid (or "bank charges"). Interest is usually payable on loans taken from the bank. For example, a loan of $10,000 may have an interest rate of 10%. This means that if you haven’t paid the loan back in a year, you would owe $1,000 more ($10,000 x 10%). It's not that difficult to put together a basic income statement. The number one thing to know when preparing an income statement is that it is drawn up from the figures in the trial balance. 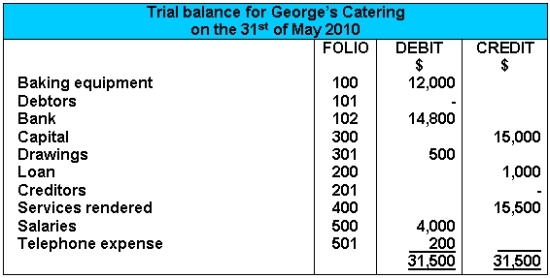 Let's return to the example we've been using throughout our lessons, George's Catering. When preparing the income statement, we look for all the income and expense items in the trial balance. Then we simply copy these over to create our report. Note that when we are creating an income statement, we only take the incomes and expenses from the trial balance - we ignore everything else (assets, liabilities and owners equity). 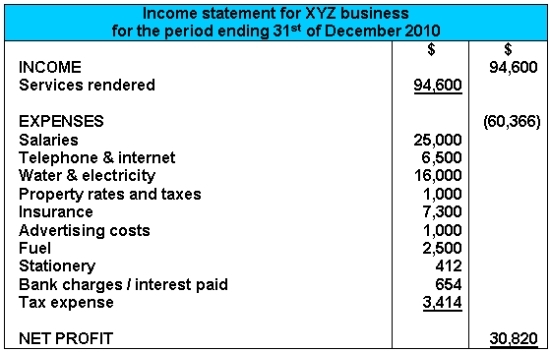 A major expense shown in our first income statement example above is tax. Tax (or "taxation") is actually shown in a simplified way in that income statement as it is a single-step income statement. In reality, companies often use more complicated "multiple-step" income statements (where key expenses are separated into categories). In multiple-step income statements, tax is shown on its own line, completely separate from all other business expenses. Firstly, companies are required to report tax as a separate line item on its income statement. Secondly, from a common-sense perspective, tax is such a major expense for most businesses that it basically deserves special attention. Finally, and perhaps most importantly, showing tax on its own line highlights the profit before tax in addition to the final profit after tax. Since tax is an expense that is not really under the control of management, profit before tax can be seen as a better indicator of how well the business was managed. An income statement usually covers a full year. That is most certainly the case when the income statement is prepared as part of a company's published annual financial statements. However, the income statement may be drawn up for shorter periods, such as one month or three months (quarterly income statement). These shorter periods are used where the business managers and employees want to analyze the performance of the business over a shorter time period to help make internal business decisions. The period of time that is covered by the income statement (and other financial statements) is called the accounting period. Budgeted income statements can also be drawn up, showing targeted figures for sales, expenses and profits. Later on, these budgeted figures can be compared to the actual figures and action can be taken to rectify any shortfalls. In the budgeted income statement example above, we can see that the actual profit for the period is about $8,500 less than what was planned for. This was due to the income being $5,400 less ($100,000 – $94,600), and the expenses (such as water and electricity) being greater than expected. These budgeted figures would normally be drawn up based on actual figures from past years, but taking into account any expected future changes. The budgeted figures (and the way these figures were obtained) could be explained or justified in additional notes to the income statement. Hope you enjoyed our tutorial on the income statement. In the next lesson we'll go over the next report in the financial statements - the statement of owner's equity.